The word lace is derived from the Latin word lacques, meaning loop or snare. The term lace extends to any openwork fabric that is created by looping, twisting, or knotting of threads either by hand or machine. Lace may be made of any fiber—silk, linen, cotton, polyester, rayon, etc. Most hand-made laces today are made from linen, cotton, or silk. Machine-made laces are most frequently made from polyester (which performs well on industrial lace machines), cotton, or a combination of both of these fibers. Lace includes areas of openwork juxtaposed with areas in which fabric or thread has been filled in, thus creating a textile which includes both an open mesh as well as opaque sections. The resulting fabric is airy and light, allowing light and air to filter in through the lace curtain, or permitting a colorful clothing fabric to peek out from behind lace used in clothing decoration. The first use of lace curtains is unknown, but it is unlikely that anyone but the very wealthy could have afforded to have put handmade lace in their windows where they could be ravaged by sun or rotted by rain. It is more likely that they were used first in the mid-nineteenth century when machinemade laces made such curtains affordable. Furthermore, as heavy curtains are coupled with lighter curtains to shield the privacy of the Victorian house, lace curtains were the logical choice for these filmy barriers. Today, the lace curtain is only made on large lace-making machines that produce thousands of yards each year. While lace curtains of other centuries would have been extraordinarily expensive, the price of mass-produced curtains is very reasonable, and curtains may be purchased of synthetics such as polyester which require little care and are available in a variety of colors. It is difficult for us to imagine the value that our ancestors placed on handmade lace. Always highly prized for its extraordinary beauty and intricate patterns, lace was considered quite a dear commodity until lace-making machines largely destroyed the market for handmade lace. Ancient Egyptian art depicts lace hairnets at about 2,000 B.C . Ancient Babylonian and Assyrian costumes include knotted ornamental braiding and knotting. Lacy fabrics were used nearly 2,000 years ago. By the Middle Ages, ecclesiastical clothing and textiles included lace, as well as exquisite and expensive clothing from the fifteenth century until the early nineteenth century. Particularly complicated and expensive, clothing laces were made by hand in the 1600s and 1700s. Laces made from fine Flemish linen were most highly prized and fortunes were spent on the acquisition of exquisite clothing laces. Sumptuary Laws, which restricted the wearing of gold, silver, jewels, an silk, boosted the popularity of lace, which was often made of plain white linen thread. By the early nineteenth century, the British were successfully producing machine-made laces with the production of a knitted net. As the machine-made laces became more common, the hand lace-maker could not compete with the low prices of the new laces and the craft waned in popularity. Astonishingly, some old machine made lace imitated the handmade laces to a remarkable degree and sometimes can only be distinguished from the handmade lace by its relentless regularity of pattern (handmade laces incorporate human flaws). This machine net could then be embroidered or appliqued by hand. By 1870, several other machine-made lace machines were in production, supplying Americans as well as Europeans with relatively inexpensive lace, including lace curtains. Nottingham lace curtains, with their characteristic square mesh ground, were imported into the United States by at least 1870. By the 1880s, it was affordable and considered a mark of good taste to purchase curtains for the Victorian parlor. By the early 1900s, lace curtains had peaked in popularity and fell from favor—they were a commodity that many had tired of and were associated with those of lesser means who wanted to appear ostentatious. Today, lace curtains are popular once again. Still prized for their airy beauty, lace curtains permit light to filter through the window, while still providing privacy. Some lace curtain companies offer patterns that have been in machine production for 140 years. Lace curtains are made either of polyester, cotton, or a combination of both fibers. Thus, raw materials are simply the yarn used in constructing the curtain. When purchased by the spools, the yarn is generally purchased in 5 lb (2.3 kg) spools. The yarn is generally a beige or natural color; curtains to be sold in colors are dyed after they are knit. Lace curtain design still generally begins with a sketch on paper. The design is then scanned onto the computer (CAD/CAM). Each scanned design is designated and sized for production on a specific piece of lace-making equipment as the machines vary in width and number of needles used per inch. Then, it's time to draft the pattern and program the pattern onto a computer disk. Designers draft the pattern using a graphing system on the computer. They determine each machine stitch to be used for each part of the pattern, i.e. "heavy stitch," "lace stitch," and "no stitch." Thus, the pattern is completely filled in, stitch by stitch, for a single repeat. Special software records the pattern and it is saved to the disk. The disk is then inserted into computerized lace-making machines, which are driven by these disks. The standard Jacquard Raschel machine is 230 in (584.2 cm) long and has at least 12 needles per inch on which four curtains may be produced at one time across the breadth of the loom. Each needle has two threads attached to it that together knit a lace curtain. One thread is attached to the warp, one to the creel. The warp thread makes a chain stitch (the looped background) and the creel yarn is the one that makes the pattern. Patterning is accomplished by varying the interlocking of the rows of loops and then by inserting these creel threads in the loops on the surface of the fabric. Pattern repeats are machine driven and the pattern is repeated again and again. Several panels can be run on a wide loom at time—four curtain panels at a time and three lace tablecloths at a time. (The panels are all attached and are taken off the machine attached to one another. They are cut apart at a later time.) It takes between 4 and 5 minutes to produce one lace curtain but four curtains may be woven horizontally across the breadth of the wide machine at one time. A Jacquard Raschel machine is 230 in (584.2 cm) long and has at least 12 needles per inch on which four curtains may be produced at one time across the breadth of the loom. Patterning is accomplished by varying the interlocking of the rows of loops and then by inserting these creel threads in the loops on the surface of the fabric. Pattern repeats are machine driven and the pattern is repeated again and again. Several panels con be run on a wide loom at time—four curtain panels at a time and three lace table-cloths at a time. original spool of yarn—often a beige or natural color. Curtains that will be sold as "white" must then be dyed white; those that are to be colored are put into dye vats. 3 After dyeing, the roll is placed in a tenter frame, where the lace is secured under clips, dried, and heat set. This drying process makes sure the curtain is framed to the right size (that the repeat is shaped to the correct size) and is then passed under an oven to dry. 4 When dry, the curtains are just the right size and shape for easily cutting the curtain repeats off the roll. The curtain panels are cut apart from the larger roll using automatic cutting equipment, hand scissors, or perhaps a hot pen. The hot pen cuts lace in a specific pattern or configuration (perhaps around a petal or flower) and seals the polyester yarn at the same time so that the knitted pattern will not unravel. 5 Curtains that are cut must be hemmed at top and bottom. Some curtains have a wide "rod pocket" sewn into the top of the curtain to accommodate a wooden or metal rod on which the curtain is hung and this rod pocket is generally 3 in (8 cm) or 5 in (13 cm) wide. The curtains are sent to industrial sewing machines where they are hemmed at top and bottom. The curtains are then folded by hand or machine and sent on a belt to be packaged and sent from the plant. Each roll of curtain goods has a ticket attached or associated with it that is essentially a report of its production. Dropped stitches or any problems in the production are detailed on the ticket. The company then has a record of damages in order to address quality problems. In addition, the computerized looms may detect and note dropped stitches with an electric eye. Supervisors are responsible for checking inspection reports and use their eyes, experience, and knowledge of the process to monitor quality as well. Dyed curtains are inspected for color, and those that are improperly dyed are sent back to the dye house for re-dye. After cutting and sewing, the curtains are inspected to ensure proper size and shape and may be re-shaped and re-sewn if necessary. Occasionally improperly shaped or sewn curtains may be sold as "seconds" at discount houses. 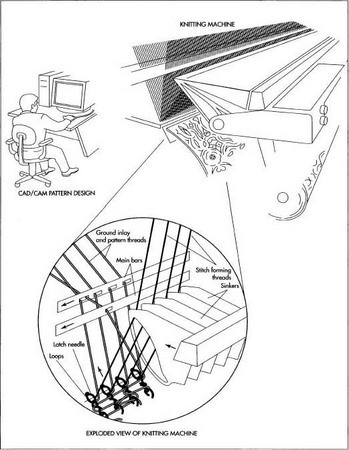 Lace curtains made with cotton yarn have a lint problem that must be dealt with in order to provide a safe environment for workers' respiration. In plants with older machines, the company must vacuum the machines daily in order to rid the air of lint. Newer plants have vacuum or suction systems built into them to reduce levels of lint. Unfortunately, cotton lint is not recyclable into new cotton thread and must be discarded as garbage. Polyester yarn does not create extraneous lint. The bits of polyester yarn left on unused spools are bundled into bales and may be recycled into new yarns. Also, dyeing of any fabric includes chemicals suspended in water, which must be neutralized and filtered according to federal standards before the effluvia is released into any water supply. Jerde, Judith. Encyclopedia of Textiles. NY: Facts on File, 1992. Ponde, Gabrielle. An Introduction to Lace. NY: Charles Scribner's Sons, 1973. Warnick, Kathleen and Shirley Nilsson. Legacy of Lace. NY: Crown Publishers, 1988.